Established 30 years, we are a 3-piece traditional Scottish Dance Band, playing for RSCDS Dances. Burns, St. Andrews nights and New Years Eve. 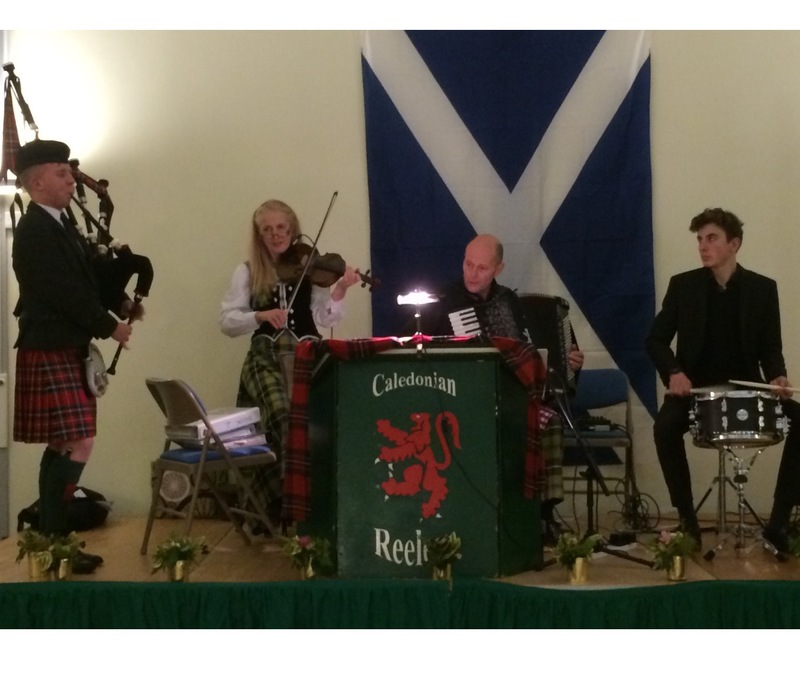 Ceilidhs for Weddings, Birthdays, Anniversaries and Corporate events. Established 30 years, we are a 3-piece Traditional Scottish Dance Band, consisting of Accordion, Fiddle, Side Drum and working with a Caller. We have a vast and evolving, repertoire of Jigs/Reels and Strathspey dance sets and are on a constant mission to seek out the best tunes we can find. All of which filters into our Ceilidh music. Being a traditional Scottish Dance Band, wearing Tartan, our aim is to evoke a true Scottish theme to our evenings, based on making sure all generations and all nationalities interact. We are professional and always take pride in every aspect of our act in order to leave both client and guests with the most enjoyable and memorable occasion possible. All RSCDS Reel, Jig and Strathspey Dance Sets. Options: Within reason, your wish is our command. Costumes / Dress: We always wear tartan - Fiddle player wearing a long Kilt or plain black with a tartan sash. The Accordionist wears either a Kilt, if the occasion dictates, or Trews. The Drummer wears Trews. Previous Clients: We primarily play, regularly, for formal RSCDS Dances all over the South-East of England. Including their HQ at St. Columbus Hall, in Pont Street, London. Also covering Tunbridge Wells, Oxford, Surrey, Dover, Kent, Sussex, Herts, Nottingham, Cambridge, Suffolk and Norfolk and Essex. We also play for Burns nights, St. Andrews nights, New Years Eves. We have played an 80th Wedding Anniversary at the Lansdowne Club in Mayfair. In Kensington Gardens (Royal Parks). Many, many Scottish themed weddings, from Claridges to Marquees in Gardens. HMS Belfast, Boat trip parties on the Thames. The list is endless! 2 x Bose L1 Tower Systems, separate speaker system for Caller. 2 x plug sockets (min).